Perfect for spa, gyms, or at home! Nothing feels better than soft, 100% cotton on your skin. 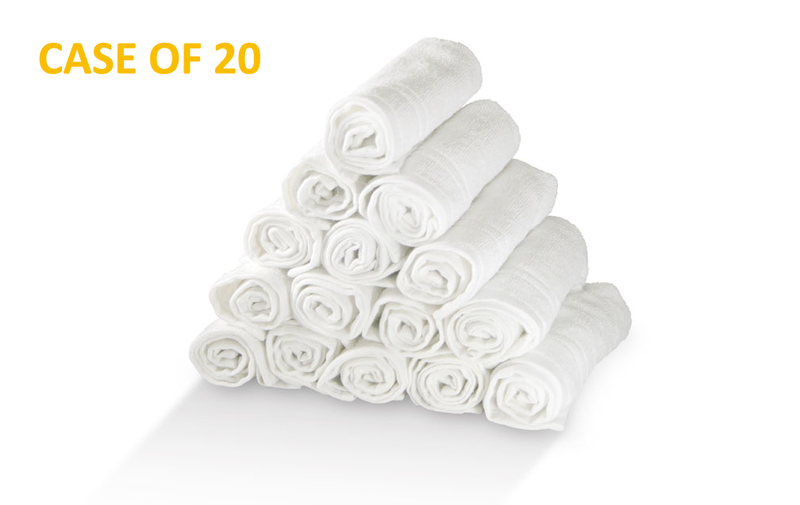 Our 12.5" x 12.5", 2-ply, 12-Piece Spa Towels are absorbent and convenient. They’re also very durable so they’ll last you a long time. These gorgeous spa-quality towels are super-soft, yet extremely durable. They can be washed thousands of times and still keep their shape and plushness. The extra-thick, 2-ply towels are sourced from 100% combed cotton and have beautifully finished ends and side hems. These 12.5" x 12.5" towels are very absorbent and perfect for spas, gyms, and nail salons. For delivery locations within the continental United States EXCEPT Chicago, New York, California, Oregon, Washington or Arizona, there is a $4 handling charge per order PLUS a shipping fee for each item. The base shipping fee for this item is $15. If you are purchasing this item and another item with a $1 shipping fee, and your delivery location is anywhere in the continental United States EXCEPT Chicago, New York, California, Oregon, Washington or Arizona, your total S&H cost will be $20 = $4 handling charge + $15 item shipping fee + $1 item shipping fee. If your delivery location is in Chicago, the shipping fee for this item is $10. If you are purchasing this item and another item with a $1 shipping fee, and your delivery location is in Chicago, your total S&H cost will be $15 = $4 handling charge + $10 item shipping fee + $1 item shipping fee. If your delivery location is in New York, California, Oregon, Washington or Arizona, the shipping fee for this item is $20. Mixed Multiple Purchase Example: If you are purchasing this item and another item with a $1 shipping fee, and your delivery location is anywhere in New York, California, Oregon, Washington or Arizona, your total S&H cost will be $25 = $4 handling charge + $20 item shipping fee + $1 item shipping fee. 30-day Money Back Guarantee. Returns must be Unused.